I'm very picky about my nail polish. I only like certain brands (OPI, Essie, MAC, Gosh and Anna Sui). And I only like certain colours. Despite my picky-ness, I probably own over 100 polishes. And...none of them are purple. I probably own every shade of red and navy, every jewel and mint green, a bunch of blacks and many grays and pinks. But not one purple. So my quest today: find the perfect purple! Easy right? NOT AT ALL. I'm still not sure how many stores I looked in, how many brands or shades. 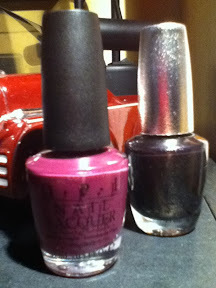 The problem: purple polishes right now seem to be very eastery (aka pastel or too pink), or almost brown. I want something dark/ jewel-tone, but still closer to a true purple. I had about given up hope when one of the delightful employees of Pure Beauty found me not one, but two purple polishes! Both by OPI, "DS Mystery" and "Louvre me Louvre me not". "DS Mystery" looks black, but it's actually a dark purple with teeny gold flecks in it that give it a sort of Russian feel. "Louvre" is more of a traditional plum, but without the brown tone a lot of plums have. 12.95$ and 9.95$ respectively. I've never actually seen pastel purple! Dark is easiest for me. I have a dark purple from NY Color. It wears off quick, but it's a great color. That's so funny! I swear, I was convinced that was the only shade of purple they were going to make anymore!